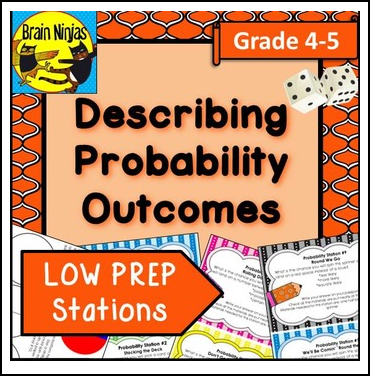 Your students can explore probability outcomes by moving through ten stations that each pose a question which can be answered with more likely, less likely, equally likely, possible, impossible or certain. One questions reads: What is the chance this 6 sided dice will land on a number between one and six? (certain) Some students had to pick up the die and look at all the sides while others could figure it out in their minds. Either way, students stay accountable by filling out a passport with each of their answers. An answer key is included. If you have three 6-sided dice, three decks of cards and a coin you have the majority of the supplies needed to set up. Templates and instructions are included to make three simple spinners. Just print the station cards and set up. It's so simple your students can even set it up for you. These stations were tested with fourth and fifth grade students who thought it was a fun way to practice the terms. They had a better understanding of the meaning of each of the terms and could provide different scenarios that would provide similar or alternative outcomes. This activity directly aligns with the Alberta Program of Studies Math-Statistics and Probability (Chance and Uncertainty) Grade 5 SO3 SO4. Be sure to check out our other math resources. Please let us know how this product works for you by rating it or providing comments. You'll get TpT credits to buy more stuff! Feel free to pin this product and look for us on social media sites. Thank you for your consideration! Happy teaching from the Brain Ninjas!